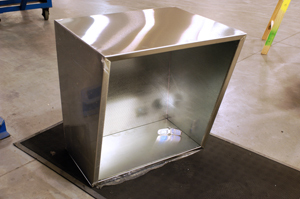 Acoustibooth is a soundproof booth or phone enclosure that is made from rugged, lightweight perforated steel. This telephone sound enclosure system is designed to combat unwanted external ambient noise in factories, airports, ships, mechanical rooms, shopping malls, and other loud public venues where phone communication is essential. Each soundproof booth is built to deliver premium quality telephone communications where background noise can be excessive. Our soundproof phone booth stations are self-installed to existing structure in your facility providing telephone communications for landline phones or cell phone use. These soundproof booth stations can deliver 12-18 dB drops for telephone privacy as we simulate in our Sound Chamber. AcoustiBooths sell for $1400 per unit + freight. For questions related to your upcoming soundproof booth needs, call our help desk at 1-800-638-9355. 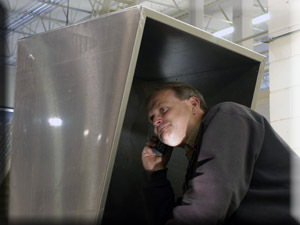 Our soundproof phone booths, Acoustibooths, measure 30” tall x 28” wide. The shelf depth at the base of the unit is 15.25” deep and the top of the unit is 23.5”. These prefabricated soundproof phone booths are ideal for use in a variety of commercial and industrial settings. They trigger average 12-18 dB drops from unwelcome ambient environmental noise spikes, delivering quality and comfort for clear telecommunications within the unit. Installations are custom per application. The standard mounting method for this soundproof booth is to bolt it to your existing wall, beam or pole surface. Note that an average 12-18 dB drop in the perimeter noise is the equivalent to a collapse of 70-90% of the noise exposure surrounding your telephone area. This generates a clear and distinct telecommunications signal inside a noise infested space. Questions? Call our help desk at 1-800-638-9355. Each soundproof booth ships individually to your project site. 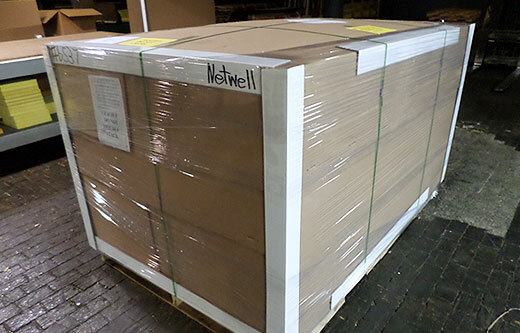 Up to 2 units per pallet, shrunk wrap, shipping via common carrier. If you have a preferred method of shipment, please indicate with your order. Installation of these units are fairly straight forward: drill two holes into the back of the piece, insert bolt with washer and attach to wall or post. One bolt near the top, one near the base of the unit. Anchor with the desired height off the floor.